MARKA, Jordan — A US-funded partnership between Jordan and Raytheon is entering the final phase of a nearly $100 million program to guard the Hashemite Kingdom against infiltrators from the Islamic State group and other extremist organizations operating beyond its border with Syria and Iraq. Fiscally supported by the Pentagon's Defense Threat Reduction Agency (DTRA), the Jordan Border Security Project is now operational along a 160-mile stretch bordering Syria and another 115-mile demarcation line with Iraq. Come August, the Raytheon-Jordanian industry team will start transitioning full sustainment operations to the Jordanian Armed Forces, according to US and Jordanian industry executives. 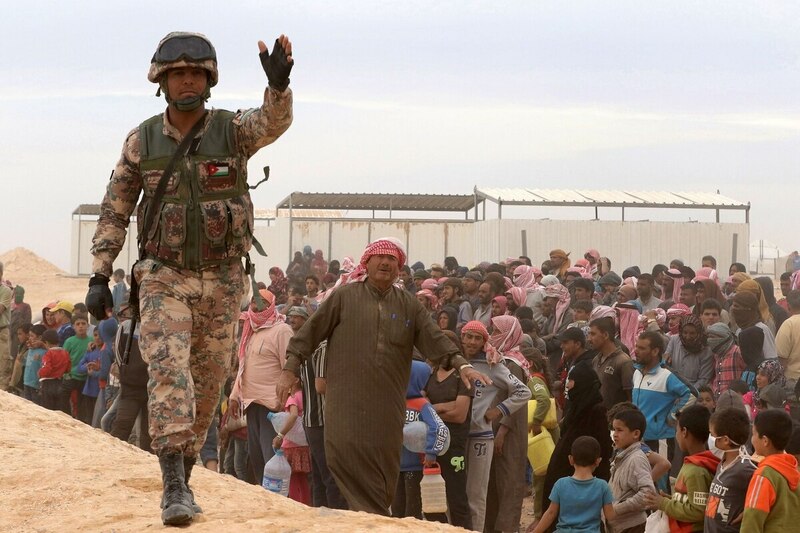 Once the transition is complete, the Jordanian military will assume full responsibility for patrolling the borders with rapid response vehicles, manning stationary watchtowers and running an operational command center to be supported by the firm's in-country company headquarters. "We're now entering the full sustainment phase," said Andrei Gugiu, director for border security and critical infrastructure protection at Raytheon's Intelligence, Information and Services division. "We're transitioning 100 percent of preventive maintenance to the Jordanian Armed Forces by August of this year." For the past two years, Raytheon and Jordanian subcontractors have been deploying and testing the sensor-fused border barriers while, in parallel, training other Jordanian partners to maintain and operate the system, industry sources said. Last July, Raytheon delivered the first two phases of a three-phased contract, valued at $79 million, to the Jordanian Armed Forces some three months ahead of schedule. The 275-mile protective system along respective Syrian and Iraqi borders is operated by company project managers and Raytheon's Jordanian industry partners. Along with the physical passive barrier, patrol paths and watchtowers, the system is integrated with day and night cameras, ground radars, and a full command, control and communications suite. "If there's a person or a car coming across the border, the system picks it up automatically and the information is relayed to operational command headquarters. All the information is fused into a common operational picture by way of Raytheon software, which analyzes all the data and sensors and helps operators make decisions," Gugiu said. By the end of next year, the third and final $18.6 million phase is expected to be completed along a relatively short but complex high-threat area where Jordan's northeasternmost border converges with the Israeli and Syrian sides of the Golan Heights. Come August, the Raytheon-Jordanian industry team will start transitioning full sustainment operations to the Jordanian Armed Forces. Unlike Jordan's other borders, which are characterized by desertlike terrain, the 12-mile stretch — known in Jordan as Wadi Glade and in Israel as the triple border meeting point — is unique for its craggy hills and densely foliaged valleys that offer ideal camouflage for aspiring infiltrators. Since the Syrian civil war began more than five years ago, this area has changed hands numerous times, from forces loyal to the regime of Syrian President Bashar Assad to the al-Qaida-linked Nusra Front and Daesh, an Arabic acronym for the Islamic State group. 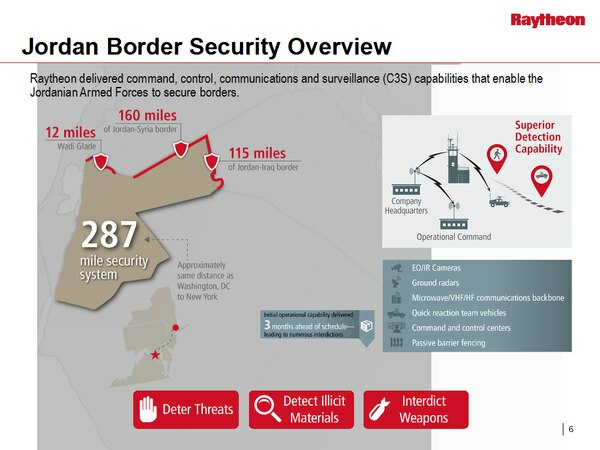 Raytheon was awarded $18.6 million last October by DTRA for the third and final, 12-mile phase of the Jordan Border Security Project to deter, detect and interdict threats. "We're now finalizing the design and we're looking to have this final system in place in 18 months or so. Once complete, the entire border with Syria and Iraq will be covered," Gugiu said. Raytheon's operations manager in Jordan, a retired general previously involved in homeland security and cyber affairs, said the barrier has already been credited with interdicting large quantities of explosives and other contraband. "Once we delivered an operational capability in 2015, there was a huge jump in the quantities of explosives and drugs interdicted at the border," said the former officer, who spoke on condition of anonymity. According to the project's in-country manager, Raytheon and local Jordanian partners are working "hand in hand with the Jordanian Armed Forces" in a methodical, three-phased sustainment transition. "In the first phase, we hone our operations and perform preventive and corrective maintenance, and they observe. Then, at a certain point, once they are confident, the second phase involves us working together on sustainment. And now we're in the third phase, which will relegate us to a support role," he said. The Jordanian project is one of more than 24 projects implemented by Raytheon in Europe, the Middle East, Southeast Asia and the Americas. The company recently fortified nearly 3,730 miles of maritime and land borders for the government of Ukraine, prior to the Russian invasion in early 2014. It is now implementing a project to secure the Philippines maritime borders, which includes the southern island of Mindanao, where government forces occasionally clash with rebel insurgents and extremist groups. "We have precautionary procedures in place and military escorts everywhere we go. We wear helmets and protective vests and, knock on wood, we haven't had any casualties."